To use GoogleApps authentication with Octopus, GoogleApps must be configured to trust Octopus (by setting it up as an App). Below are the details for how to configure the App. To configure an App within GoogleApps, you must have a Developer account at https://developers.google.com. This account will own the App configuration, so we recommend you create an account for company use, rather than using an individual account. Select API Manager ➜ Credentials Menu. Set the OAuth consent screen information. In the Application Logo box, upload a logo to make it easy to identify the application. You can download the Octopus logo here. Add the Top Level Domain of your Octopus instance to the Authorized domains list. If you are setting Google Apps up for Hosted Octopus this will be octopus.app or octopus.com. Select the Credentials tab and Create a new OAuth client ID for a Web app. Enter a Name for identification, e.g. Octopus. This is the name that will appear when the user is asked to allow access to their details. Add https://octopus.example.com/api/users/authenticatedToken/GoogleApps (replacing https://octopus.example.com with the url of your Octopus Server) to the Authorized Redirect URIs. Be aware that the path in this url after the domain name was case sensitive during our testing. That's OK, you can use http if you do not have SSL enabled on your Octopus Server. Please beware of the security implications in accepting a security token over an insecure channel. You can configure the GoogleApps settings from the command line. You will need the Client ID from the Credentials tab and your hosted domain name. Alternatively these settings can be defined through the user interface by selecting Configuration ➜ Settings ➜ Googleapps and populating the fields Hosted Domain, Client Id and Is Enabled. We do our best to log warnings to your Octopus Server log whenever possible. 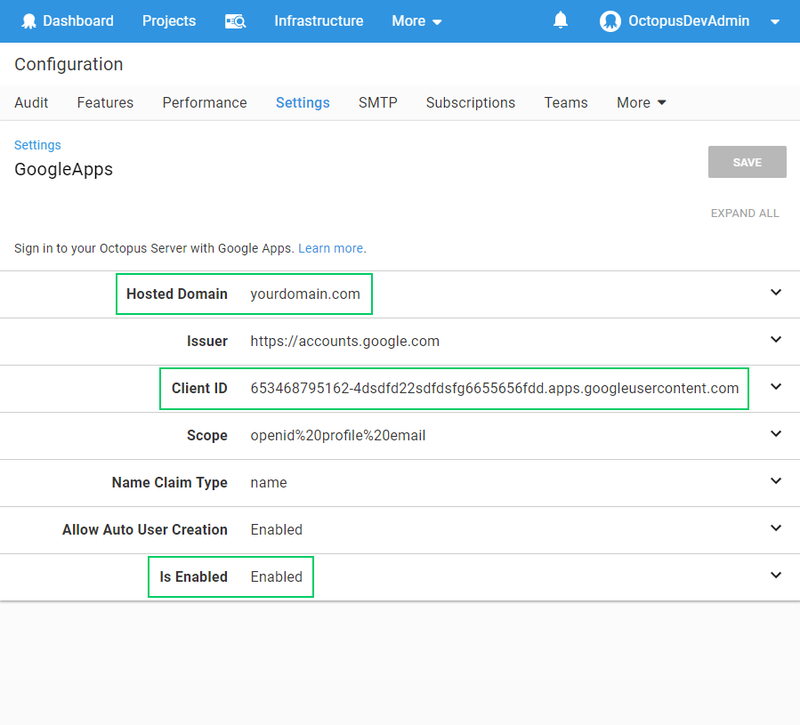 If you are having difficulty configuring Octopus to authenticate with GoogleApps, be sure to check your server logs for warnings. You can see the OpenID Connect metadata by going to https://accounts.google.com/.well-known/openid-configuration. 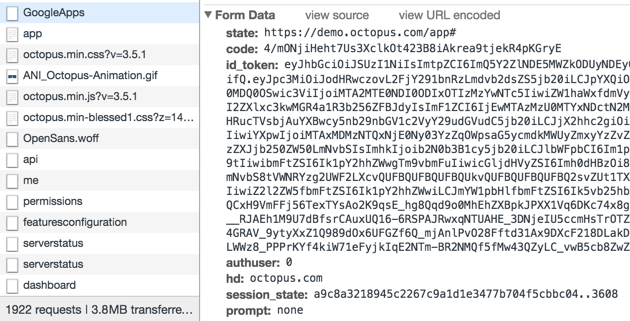 Attempt to sign into Octopus using GoogleApps and find the HTTP POST coming back to your Octopus instance from GoogleApps on a route like /api/users/authenticatedToken/GoogleApps. You should see an id_token field in the HTTP POST body. Don't worry if jwt.io complains about the token signature, it doesn't support RS256 which is used by GoogleApps. If you are not able to figure out what is going wrong, please send a copy of the decoded payload to our support team and let them know what behavior you are experiencing.